Shoreditch, August 22, 2012. Today, the London Art Wall Group announced that Baroness Grey-Thompson DBE will unveil her Access to ALL Areas' mural on their Shoreditch Art Wall (SAW), on Friday, August 31st at 4:00 p.m. at 17-19 Great Eastern Street, Shoreditch, London EC2. The event will focus on the former Paralympians full-time endeavor to help the UKs disabled be able to live more independent lives by revamping its towns and cities to be more wheelchair friendly. She will be accompanied by the Right Honorable Edward Vaizey, the Minister for Culture, which includes museums and galleries, and Peter Mackeonis, the event organizer, when she unveils the four-panel piece painted by London international artist Code FC. Artists, media, politicians and charitable organizers are welcome to attend this important event. 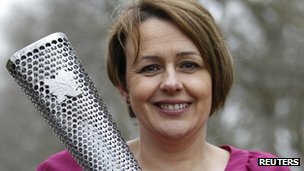 As a sixteen-time Paralympic medalist, who holds 11 gold medals and 30 world records, the plight of the disabled in the UK is something the Baroness comes face-to-face with on a regular basis. Her mission to draw attention to the UKs urgent need to install sidewalk ramps and wheelchair lifts in buses and trains was highlighted earlier this year when she was left stranded on a train at Londons Kings Cross Station at midnight after her aid failed to show up to help her disembark in her wheelchair. Luckily, a workman was present to help; otherwise, she would have been forced to stay on the train all night. Baroness Grey-Thompson commented, I have always believed that sport has the power to effect change, and I do hope that the London 2012 Paralympic Games will not only be a showcase of all what disability sport has to offer, but also the catalyst for changes in attitude to disabled people and their needs. Continuing, We can start by making all transport accessible so that disabled people have the same opportunities to work and shop that most people take for granted. This is not the first social commentary mural to feature on SAW. Last month SAW hosted and funded Lord Michael Bates 'Walk for Truce mural, painted by Code FC and Jack Haslehurst; honoring his 13 month, 3,000 mile trek from Olympia, Greece to the House of Parliament, to bring attention to UN Resolution 48/11, calling for all nations to lay down their weapons during the Olympic Games. And, it is not to be the last. During the month of September, muralst 'Inkie' will be painting SAW in support of Great Ormond Street Hospital for Children and in December The London Art Wall Group is planning to involve local artists in a 'Homeless For the Holidays' mural to highlight the plight of the ever-growing homeless population in London. SAW is a venue for major advertisers, as well as for new and established artists, but The London Art Wall Group would also like to be contacted by charities who are interested in featuring their cause on the wall. SAW can be rented by the day, week, or month - all year long. The 60 square meter space contains four 8 ft. by 10 ft. canvases, which can be painted individually, or the entire wall can painted. Previous advertisers on the Shoredicth Art Wall have included: 20th Century Fox, The Disney Company, Adidas, Oakley, Namco Bandai, Beck's, Universal Pictures. Paralympian, Baroness Grey-Thompson to unveil her Access to ALL Areas mural in Shoreditch, August 31, 2012 at 4:00 pm accompanied by Minister of Culture, Edward Vaisey, calling for the UK to help its disabled lead more independent lives by making its towns and cities wheelchair friendly by installing pavement ramps and wheelchair lifts in buses and trains, to be painted by London artist CODE FC. London Art Wall Group is planning a large social awareness mural for the London 2012 Olympics and Paralympics to acknowledge Lord Bates' 'Walk for Truce' & Baroness Grey-Thompson's 'Plight of the Handicapped' on a prime London wall in Shoreditch near great clubs, pubs, restaurants & the Olympic Village. Former clients are Disney, 20th Century Fox, Universal, Beck's Beer & Namco Bandia. A prime London (Shoreditch) wall space advertising opportunity available to global advertisers during the 2012 London Olympics on high-traffic Great Eastern Street, across from the renown Village Underground Art Center, surrounded by great clubs, pubs & rest'aurants and close to the Olympic Village.